Groundless firings, withheld wages, bad working conditions—these and other abuses are certainly nothing new. The large mainstream unions are often unwilling to fight and are losing members and influence as a result. For those employed in precarious positions, whether as immigrant or flexibilized labor, the state often offers little or no protection. How can we defend ourselves against the power of the bosses? 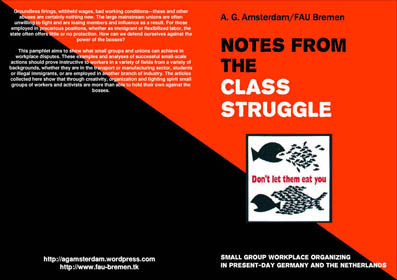 This pamphlet aims to show what small groups and unions can achieve in workplace disputes. These examples and analyses of successful small-scale actions should prove instructive to workers in a variety of fields from a variety of backgrounds, whether they are in the transport or manufacturing sector, students or illegal immigrants, or are employed in another branch of industry. The articles collected here show that through creativity, organization and fighting spirit small groups of workers and activists are more than able to hold their own against the bosses. De propaganda is dood, lang leve de verspreiding van ideeën. Onze vrienden van De Nar komen spreken over het belang van ideeën en deverspreiding daarvan. Ideeën liggen in tegenstelling tot ideologieën verankerd in de werkelijkheid; ze zijn niet afgescheiden van de praktijk en staan daarmee in wisselwerking. Ze zullen uitleggen hoe zij menen dat we onze ideeën het best kunnen verspreiden, in situaties die ze betekenisvol en tastbaar maken: over pamfletjes, krantjes en agiterende acties – waarin de verspreiding van ideeën rechtstreeks verbonden wordt met een situatie, waarop je via actie inspeelt of die je via actie zelf creëert. 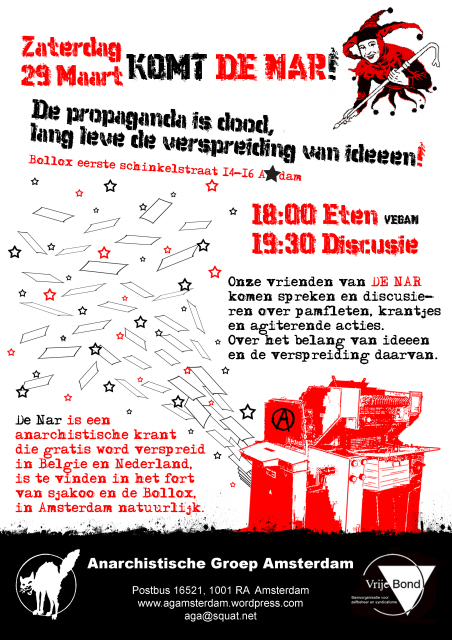 De Nar is een anarchistische krant die gratis wordt verspreid in België en Nederland. In Amsterdam is De Nar te vinden in het Fort van Sjakoo en in de Bollox.